Acelan is a neonicotinoid insecticide which controls sucking pests especially Aphids and White Fly by interrupting the brain signals, causing paralysis and then extermination. 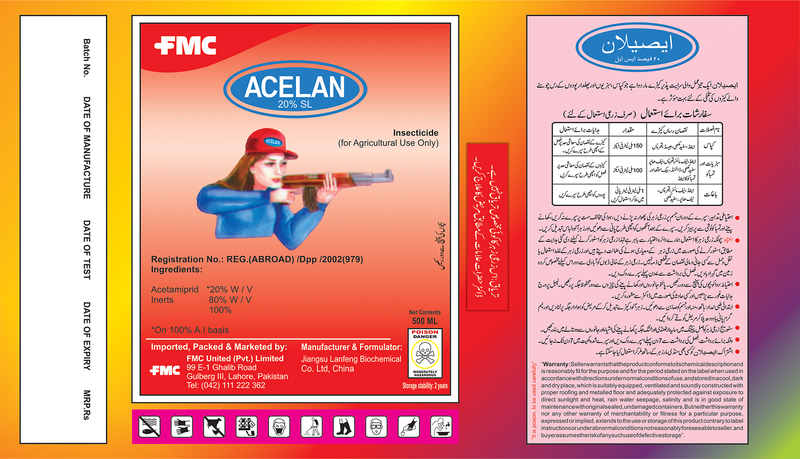 Acelan is one of FMC premier cotton specific brand while it shows high effectiveness in orchards as well. 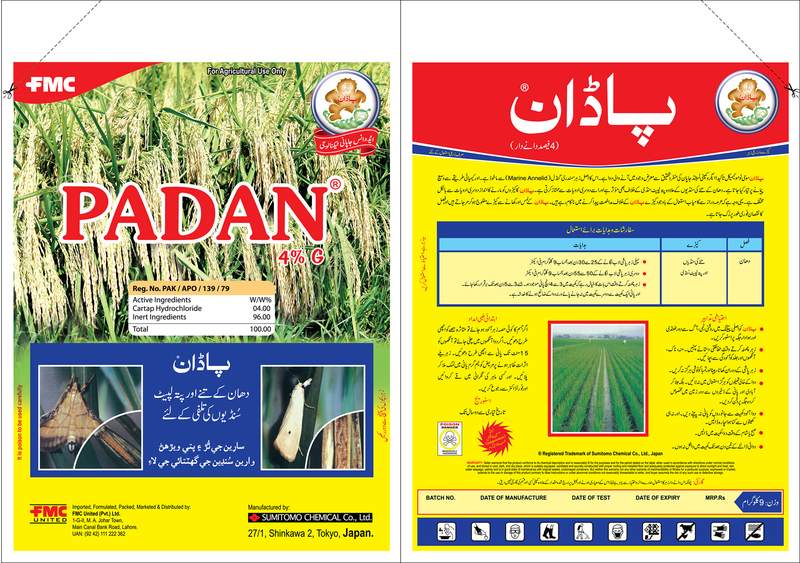 The organic composition of Acelan makes it an ideal choice for farmers to combat complex pest attack. Admiral is an easy to use, selective insect growth regulator with attributes well-suited to managing whitefly populations. 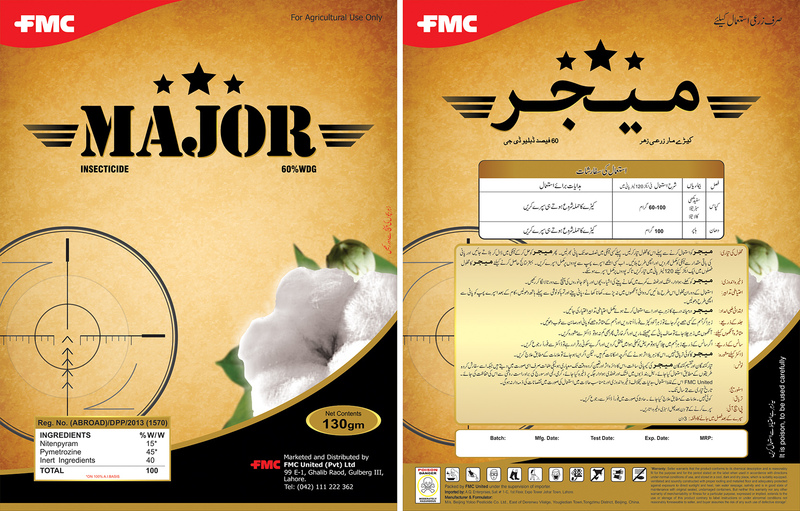 Admiral contains pyriproxyfen, a juvenile hormone mimic that interferes with whitefly reproduction and development. Juvenile hormone is secreted naturally in the early larval stages of insects and is responsible for maintaining larval characteristics. As juvenile hormone levels in the insects decrease and disappear over time, they progress on to later instars and ultimately pupate and emerge as adults. Juvenile hormone also controls insect ovary development. It is a pyridine-based pesticide which is found to be effective against a variety of arthropoda. Advantage 20%EC is a broad spectrum insecticide for insect control in several crops. Advantage is a systemic, broad-spectrum carbamate insecticide registered in more than 80 countries. Advantage is a unique chemistry provides superior control of pests in rice cotton and other crops to maximize yield and quality. The protection provided by Advantage helps the farmer to fight off most of the sucking and lepidopterous insect pests like aphids, thrips, hoppers, borers etc. Arrivo is a synthetic pyrethroid used as an insecticide in large-scale commercial agricultural applications as well as in consumer products for domestic purposes. It behaves as a fast-acting neurotoxin in insects. It is easily degraded on soil and plants but can be effective for weeks when applied to indoor inert surfaces. It is a Commodity broad-spectrum pyrethroid insecticide manufactured by many companies and used in a wide range of applications. The product offers low-cost pest control and maintains a strong position in the pyrethroids market. However, the use of this chemical is down from peak levels due to several factors: loss of market share to resolved pyrethroids; increase in B.t. crops; and recent insecticide introductions offering novel modes of action. Bestox is a widely used pyrethroid insecticide that is a partially resolved pyrethroid with several crop, animal, and public health applications. Originally introduced by Shell before being acquired by Cyanamid as part of that business in 1994, and subsequently by BASF in 2000. Now a commodity product but still one of the leaders in the pyrethroid sector. Gained EU approval in 2015 for non-crop uses. 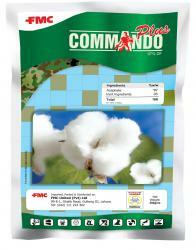 Commando Plus 97% is a Broad-spectrum organophosphorus that is consistently one of the largest selling insecticides on the global market. 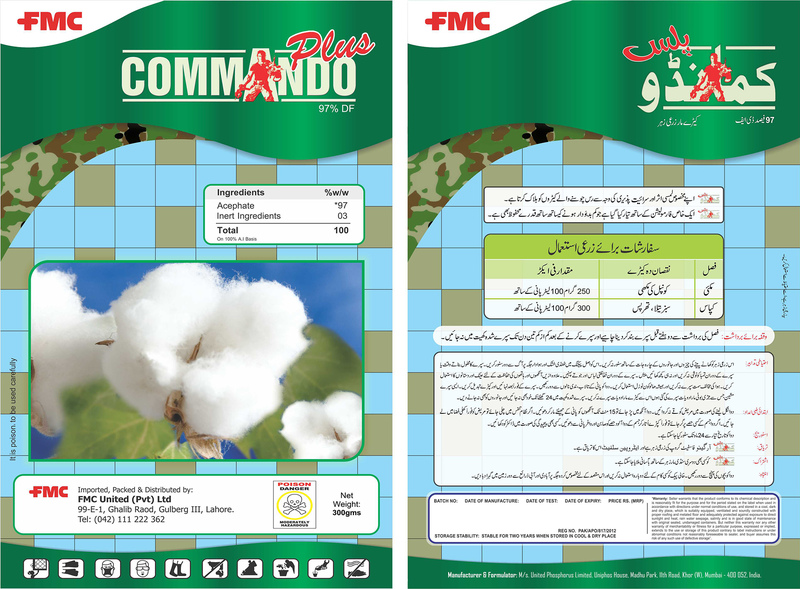 Commando Plus has 22% more active ingredient than other products available in the market, which makes it a superior product. Its DF formulation makes it a relatively a safer product for farmer usage. It has complete control on thrips and jassid in cotton. CORVUS is used on a wide range of crops including cotton, Groundnut, pome fruit, citrus, potato and vegetables (Cabbage, Tomato), Gram against a wide range of Lepidopterous pests. 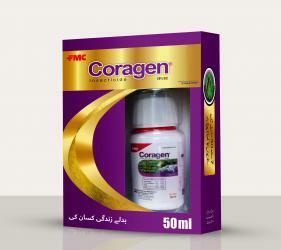 CORVUS is an insecticide of the benzoyl urea family. 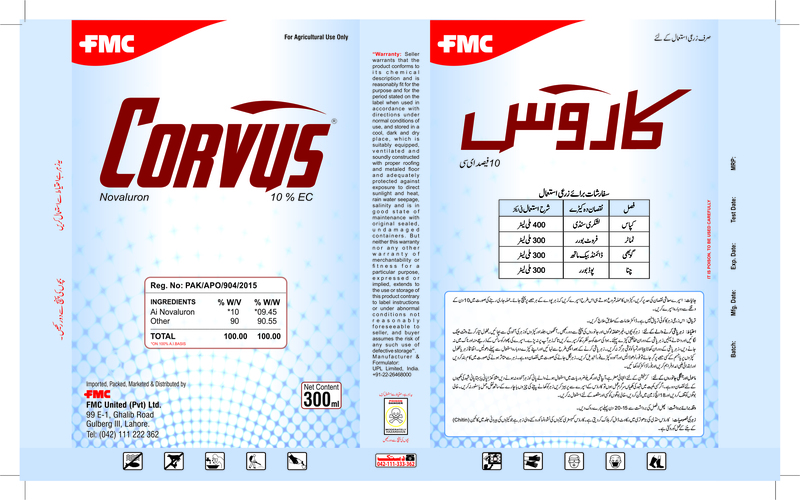 CORVUS is an insecticide which inhibits chitin synthesis, affecting the moulting stages of insect development. CORVUS is stomach poison which acts mainly by ingestion, but it also has some contact activity. Larvae have to feed Corvus treated plant parts. After feeding Corvus treated plant parts, Larvae stops feeding within few hours and death occur within 3 to 5 days of the ingestion , depending upon next molting . 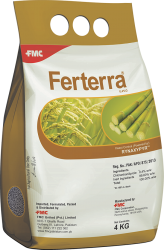 Ferterra® insecticide is a revolutionary granular formulation for rice pest management. Ferterra® provides effective and long duration control of yellow stem borer in rice and stem borer in sugarcane with its unique mode of action. 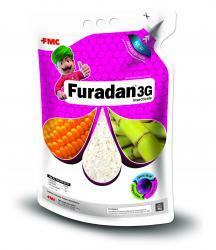 FMC Ferterra® insecticide is a revolutionary granular formulation for rice pest management in India. Ferterra® provides effective and long duration control of yellow stem borer in rice and stem borer in sugarcane with its unique mode of action. 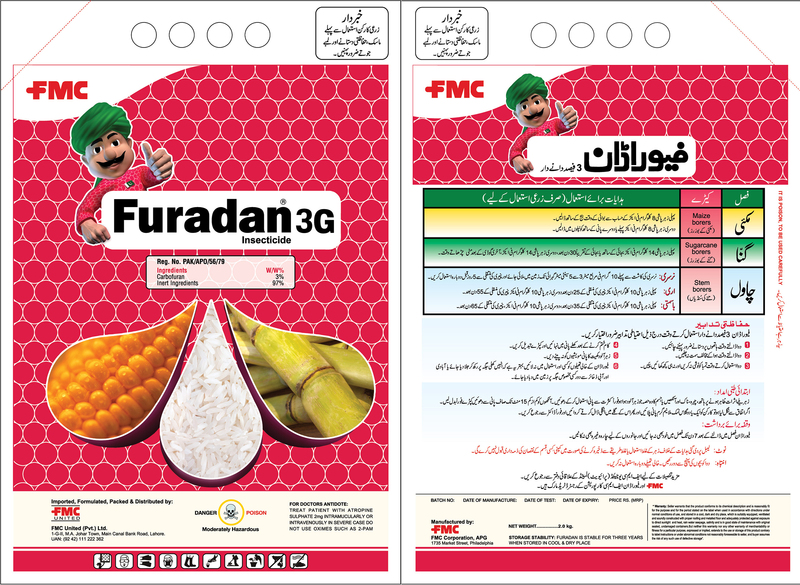 FMC Ferterra® (chlorantraniliprole 0.4% GR) , is an insect control compound from a new class of chemistry, the Anthralinic Diamides for rice pest management. When used early in the pest life cycle, Ferterra® prevents the buildup of pest population and maximizes the crop yield potential. Ferterra® insecticide is powered by active ingredient Rynaxypyr®, which has a unique mode of action; controlling pests resistant to other insecticides while its selectivity to non-target arthropods. When applied at the right stage of rice crop, Ferterra® provides complete control of borere which enables the plant to express its true genetic potential. As a result, farmers experience good crop establishment, more number of productive tillers, superior grain quality and better yield. 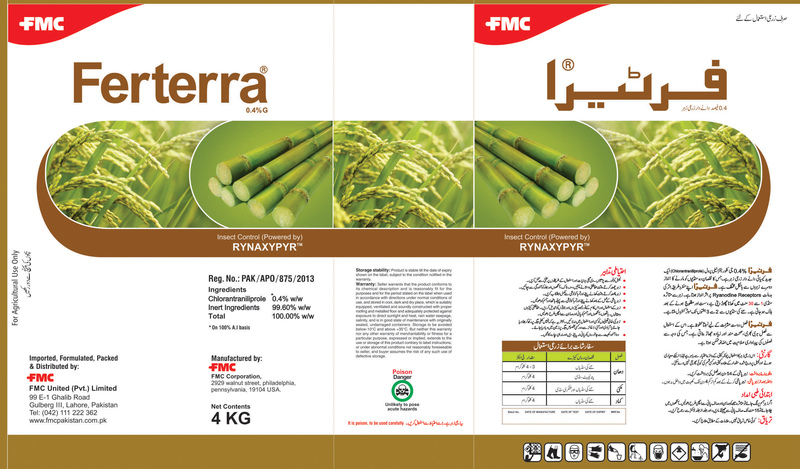 Ferterra® insecticide is recommended in rice and sugarcane crops. Ferterra® offers remarkably low toxicity to mammals and raises the benchmark for insect control solutions due to its toxicological profile and low use rates. Hoopoe is a revolutionary chemistry for control of chewing and sucking insects (particularly Lepidoptera and Coleoptera) in Rice crop, at almost all stages of development. It has a quite different mode of action from that of other insecticides. It is effective against insects mining in plants by its systemic action. It can control insects resistant to other insecticides. It has almost no effect on natural enemies of insect pests. It is practically nontoxic to mammals. It has a long persistent efficacy. It can control almost all stage of insects. DuPont™ Lannate® LV goes to work quickly, stopping more than 140 damaging insect pests almost immediately to protect yield and quality. With both contact and translaminar activity, Lannate® LV is effective on insects that not only feed on top of the leaf, but also the bottom, including armyworms, cereal leaf beetle, aphids, thrips, earworms, European corn borer, corn rootworm adults, flea beetles, picnic beetle, aphids, variegated cutworm, sorghum midge and sorghum webworm. Lannate® LV can add another mode of action to help manage the threat of resistance. Lannate® LV offers significant flexibility, working over a wide range of temperatures. 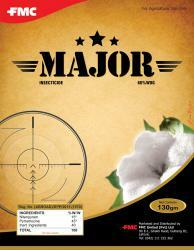 Major is a premix of 2 effective insecticides with broad spectrum mode of action. Neonicotinoid insecticides for the control of sucking insects in rice, vine, vegetables, tea and fruit. Nitenpyram blocks the neurotoxin /neural messages and binds particularly tightly in the central nervous system of insects, causing rapid death. After ingestion, it begins killing adult fleas within 30 minutes, 45and effects continue for up to 48 hours. 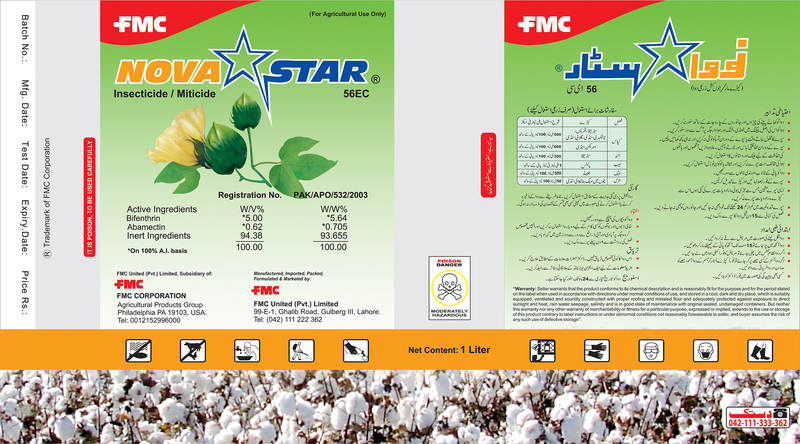 Novastar is another star brand of FMC Pakistan which is a bi-product of two highly effective chemicals, Bifenthrin & Abamectin. Both Bifenthrin and Abamectin act on insects by interfering with their neural and neuromuscular transmissions, complimenting each others effect to enhance efficacy. That is why it is a single solution to wide spectrum of pests including sucking, bollworms and mites. 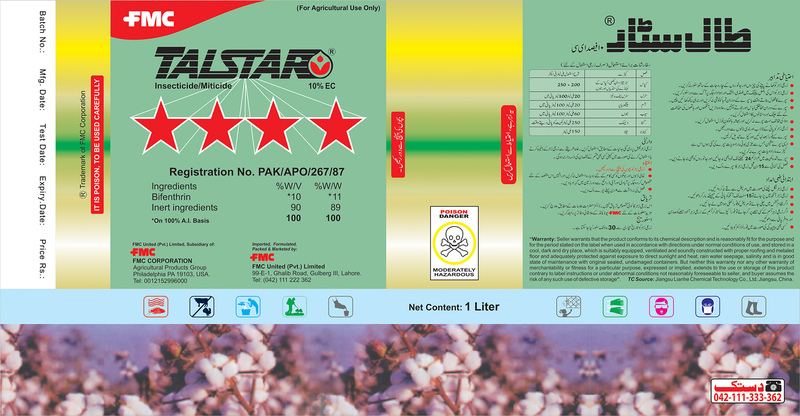 Novastar is highly established on Cotton, Orchards and Vegetables. 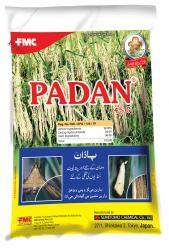 PADAN is a revolutionary chemistry invented by Takeda Chemicals Japan, that revolutionized the rice insect control dynamics used for control of chewing and sucking insects (particularly Lepidoptera and Coleoptera), at almost all stages of development. It has a quite different mode of action from that of other insecticides. It is effective against insects mining in plants by its systemic action. It can control insects resistant to other insecticides. It has almost no effect on natural enemies of insect pests. It is practically nontoxic to mammals. It has a long persistent efficacy. It can control almost all stage of insects. FMC™ Steward® EC insecticide delivers fast broad-spectrum control of many worm pests and other insect pests to help growers protect alfalfa, cotton, peanut and soybean crop yields. Steward® EC has a novel mode of action that works fast, targeting insects through ingestion as well as contact activity. Quick feeding inhibition prevents damage for excellent crop protection. Residual activity lasts up to 14 days to help prevent build-up of pest populations and further maximize yield potential. Steward® EC also controls selected sucking insect pests such as cotton fleahoppers and tarnished plant bug. Steward® EC has an favorable environmental profile and uses on all labeled crops are designated as Reduced Risk by the EPA. With a unique mode of action and minimal impact on beneficial species, it’s an excellent partner in IPM programs when used in accordance with label directions. 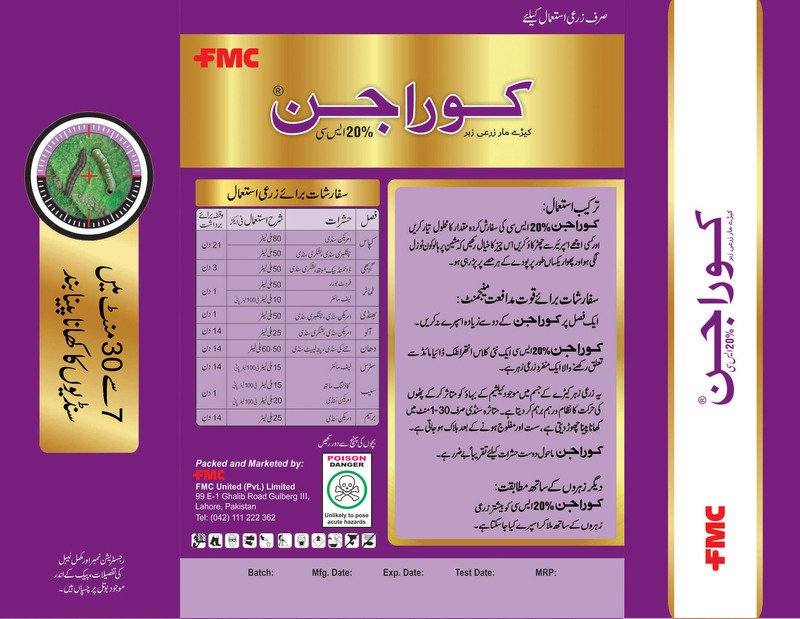 Talstar is one of the star brands of FMC that has been creating wonders for farmers for more than three decades. Its universal usage and high effectiveness have made it top the mind priority of many so much so that it is considered the face of FMC today. Talstar consists of Bifenthrin, a pyrethroid insecticide, that works by disrupting the nervous systems of insects. Talstar counters all the sucking pests, boll worms, mealy bugs, black bugs and mites. Well rounded nature of Talstar makes it viable for multiple crops including Cotton, Orchards and Sugarcane to name a few. Talstar also gives unusual shine to crops it is sprayed, coupled with its ability to keep pests away from fields, make Talstar one of the most sought after insecticide in the country. Telsta is an insecticide developed by Takeda Chemical Industries and Bayer AG. 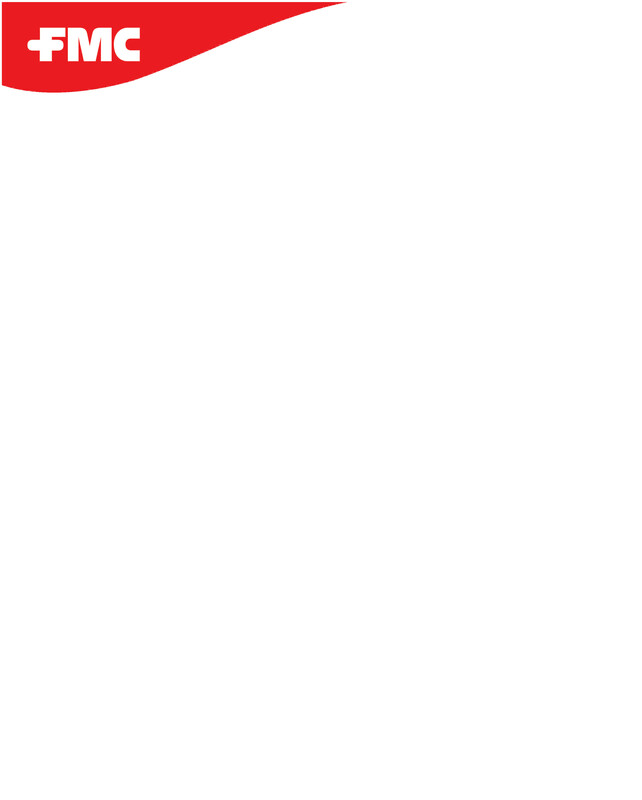 Similar to thiamethoxam and imidacloprid, it is a neonicotinoid. Clothianidin and other neonicotinoids act on the central nervous system of insects as an agonist of acetylcholine, the neurotransmitter that stimulates nAChR, targeting the same receptor site (AChR) and activating post-synaptic acetylcholine receptors but not inhibiting AChE. Clothianidin is an alternative to organophosphate, carbamate, and pyrethroid pesticides. It poses lower risks to mammals, including humans, when compared to organophosphates and carbamates. It has helped prevent insect pests build up resistance to organophosphate and pyrethroid pesticides.